Look below to experience the world of fresh dough and learn how we build on our traditional master baking heritage to create delicious products that are easy to use. We offer a variety of doughs inspired by our master-baking heritage. We take pride in the high level of quality provided to our customers. 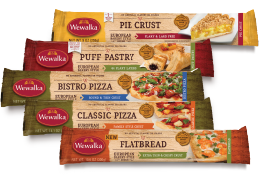 We provide authentic, bakery-style dough that your customers will love. Learn how we respect our resources and work to constantly improve our sustainability. We ensure high-quality products using artisan and mechanized production. View our job openings and see how you can join our passionate team.